On Friday, June 14, the Police Department will be temporarily diverting traffic in the area of Wrangleboro Road due to heavy traffic expected at the Absegami High School graduation. From 3:30 PM until approximately 5:00 PM, Wrangleboro Road southbound will be closed to through traffic at the south entrance to Walden Way. Southbound graduation traffic will be permitted to proceed to the High School until the parking lot is filled. Wrangleboro Road northbound will remain open as usual with traffic permitted to enter the High School lot until the parking lot is filled. Once the High School lot is filled graduation traffic will be directed to Reeds Road from Wrangleboro Road. Parking will be available at the Reeds Road and Roland Rogers School as well as the Galloway Township Middle School. The access road from the Reeds Road School parking lot leading to the High School will be open to pedestrians. Shuttle buses from the Reeds Road School lot to the High School will be available. Motorists who are not attending the graduation are advised to find alternate routes of travel to avoid delays. The heaviest traffic is expected from 3:30 PM to 6:00 PM and 7:00 PM to 8:00 PM. Traffic congestion during these time periods will also affect the area Jim Leeds Road from Wrangleboro Road to the Garden State Parkway. 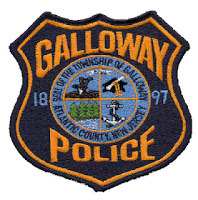 Any questions may be directed to the Galloway Township Police Department at (609) 652-3705 x 332.